[Solved] Is It Possible to Find iCloud Account by IMEI? Mark’s issue is very common. As an iOS device owner, you may forget your Apple ID. Since it is easy to access the device’s IMEI number, you would want to know whether it is possible to find iCloud email address by IMEI. In this article, we will tell you whether it is possible to find iCloud account by IMEI. We will show you the various ways you can use to find the iCloud ID. Also, you will learn how to remove an iCloud account from a device without the Apple ID or password. Part 1: Can I Find iCloud Account by IMEI? Part 2: How to Find iCloud Account? Part 3: How to Remove iCloud Account without Password? It is not possible to find iCloud account by IMEI. The IMEI does not store the data you use on your iOS device. It usually has information about the device and its hardware. The iCloud account you have on your iOS device won’t be related in any way to the device’s IMEI number. Hence, the IMEI number won’t have your iCloud ID information. This makes it impossible to find iCloud email address by IMEI. Your iCloud ID is simply an email address. If you cannot remember the email address you used with your iCloud account, chances are that you have more than 1 email address. You can try all your email addresses to see if one of them will work. If you are the original owner of the device and you still have access to all the email addresses you had when you first activated the device, one of the email addresses should be the iCloud ID. Apple will use your Apple ID to contact you. Looking for emails sent to you by Apple can help you figure out which email address is your Apple ID. To locate emails sent to you by Apple, you will only need to open all your email accounts and type in “Apple” in the search bar. If you happen to find newsletters from Apple in one of the email addresses, there is a high likelihood that the email address is your iCloud ID. Often, iOS device owners have the same Apple ID on all their devices. Therefore, if you have other iOS devices, you can locate the Apple ID in the iCloud settings. 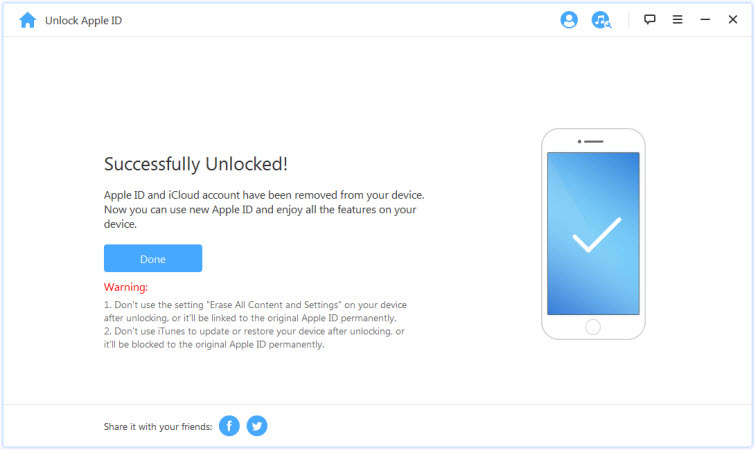 The Apple ID on the other devices may work for the device whose iCloud ID you cannot recall. Click the “look it up” link which appears under the Apple ID textbox. Enter the required information and click Continue. 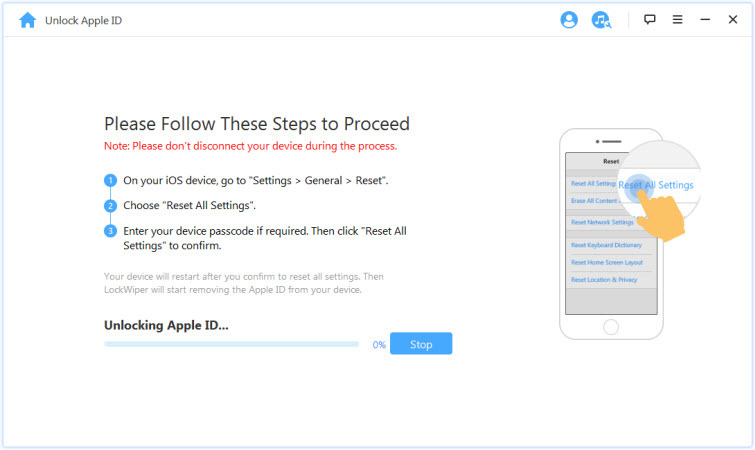 Follow the onscreen instructions to recover the Apple ID. Maybe you purchased a secondhand iDevice. Finding the iCloud ID and password for the device may be impossible. Maybe you bought the device when it was new. However, all the methods we have outlined above could not help you find the iCloud email address. You can remove the iCloud account from the device without the need for the Apple ID or password. The tool will make it possible for you to remove the iCloud/Apple ID from your iPad/iPhone/iPod Touch without a password. After the Apple ID removal, you will have the ability to create a new account or change to a different iCloud account. LockWiper will give you full control over your iDevice. LockWiper will make it possible for you to download and purchase apps and games on the App Store and iTunes. Step 1. After launching LockWiper on your PC, select the “Unlock Apple ID” mode. Step 2. Using a USB cable, connect the iDevice to the PC. 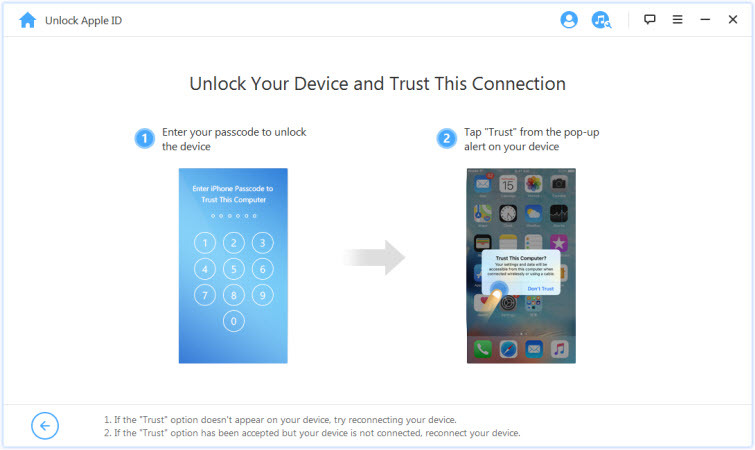 Enter the device’s passcode and trust the PC. Step 3. Tap “Start to Unlock”. Note: If the Find My iPhone feature is already off, the iCloud account will be removed immediately. If Find My iPhone is enabled, you will have to reset all settings by going to “Settings > General > Reset All Settings”. Step 4. After resetting all settings, LockWiper will remove the iCloud account from your device. It is impossible to find iCloud account by IMEI. As we have already mentioned, the IMEI does not store any data you use or have on your iPhone. There are some ways which may help you locate your iCloud ID. We have included these ways in this article. If after trying the ways we have outlined above you still cannot find your iCloud ID, you can remove the iCloud account from your iDevice. You can use a tool known as iMyFone LockWiper to remove the account. iMyFone LockWiper does have a free trial version.